Donut King is selling a new range of donuts designed to bring Australian adults back to their childhood. The ‘Ungrown-Up Range’ is inspired by the shift towards overindulgent donuts that feature lots of fillings and toppings. Flavours in the range include ‘Ice Bae Bee’, ‘Donut Be Jelly’, ‘Tough Cookie’ and ‘Smarty Pants’. 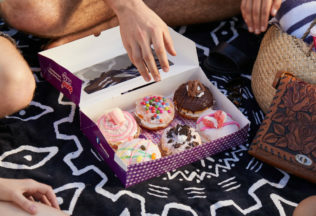 Donut King Brand Manager, Raquel Hine, said the brand’s youthful approach to the new range represents an extension of their core product line, based off current trends. “We’re going one step further and tapping into our consumers’ inner child by giving them a taste of the past, with nostalgic confectionary favourites such as jelly beans, strawberry rings and coconut ice – to name a few,” Hine said. The range is primarily targeted at millennials with every aspect of the range designed to resonate with this group of Australians. “We wanted to make sure that everything about the range resonated with our consumers, down to the name of the donuts, their look and of course the delicious flavour,” Hine said. The Ungrown-Up range is available now from Donut King stores across Australia. In an Australian first, shoppers can now purchase pork jerky at Woolworths and IGA supermarkets. Costco has announced it will be opening its first store in Western Australia.